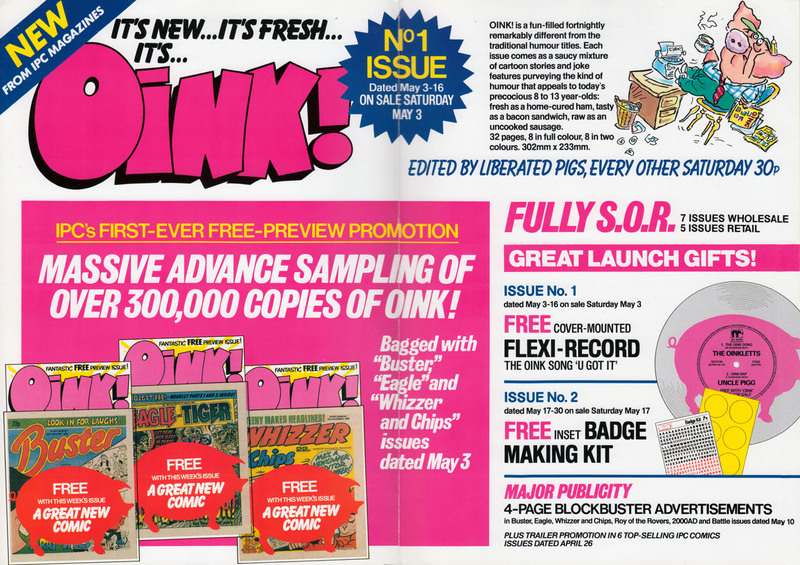 A few issues into Oink's run, another preview issue was bagged with a few other comics, but this time it merely reprinted issue 7. Team Toxic investigate the Bubbles of Doom! 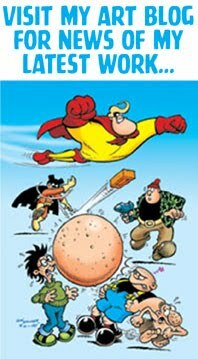 When bubbles filled with farts burst forth on the surface of the sea gassing trawlermen it's up to Team Toxic to get to the bottom of it. 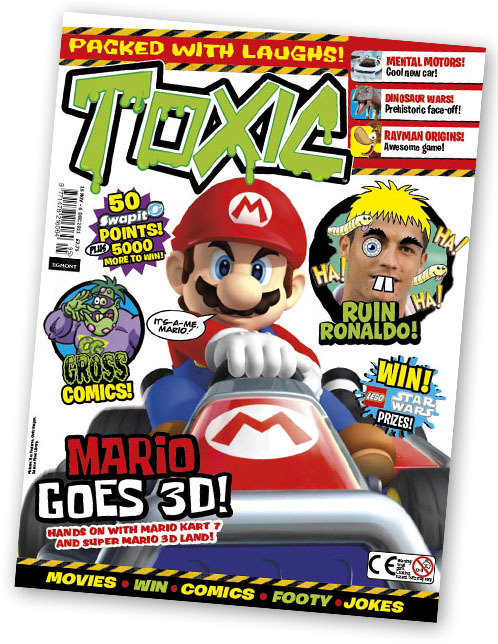 The latest issue of Toxic, out now, features the Team investigating The Bubbles of Doom. 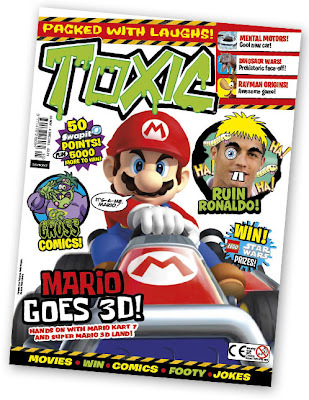 Toxic No. 195 also features other new comic strips Captain Gross, Luke's Spooks, and Busted Bieber. There's also a bunch of features and several free gifts (including a basketball game and 'Nail Through Finger' prank I did the artwork for). 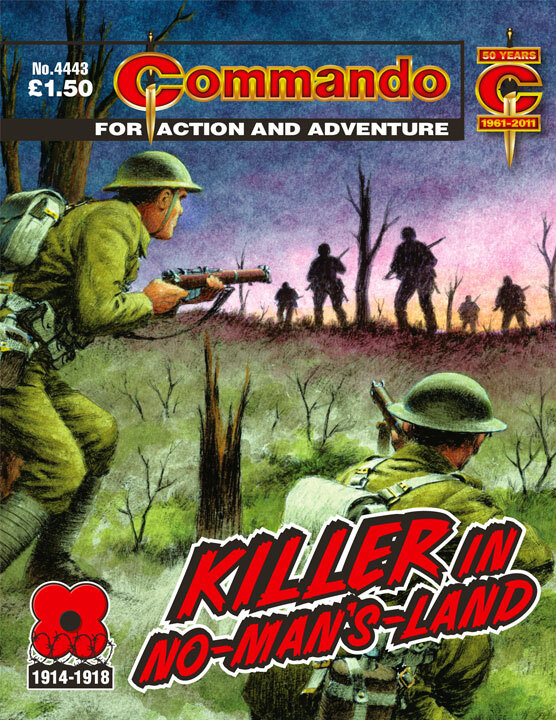 Four more Commando editions on sale now! The proudest possessions of any regiment are its colours — the flags which it carries into battle. 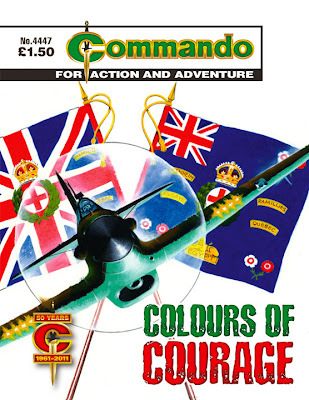 Its history is recorded on these colours, the victories it has won. A regiment guards its colours fiercely. To have them captured by the enemy is a terrible thing. But when a man hands over the colours to save his own skin it is a disgrace that brave soldiers can hardly bear think about. 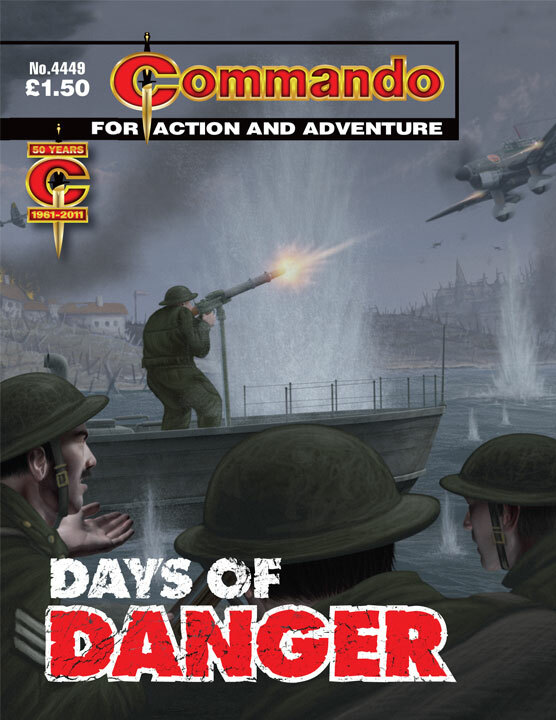 If there are two things difficult to get right in a Commando they are French Resistance stories and ghosts. 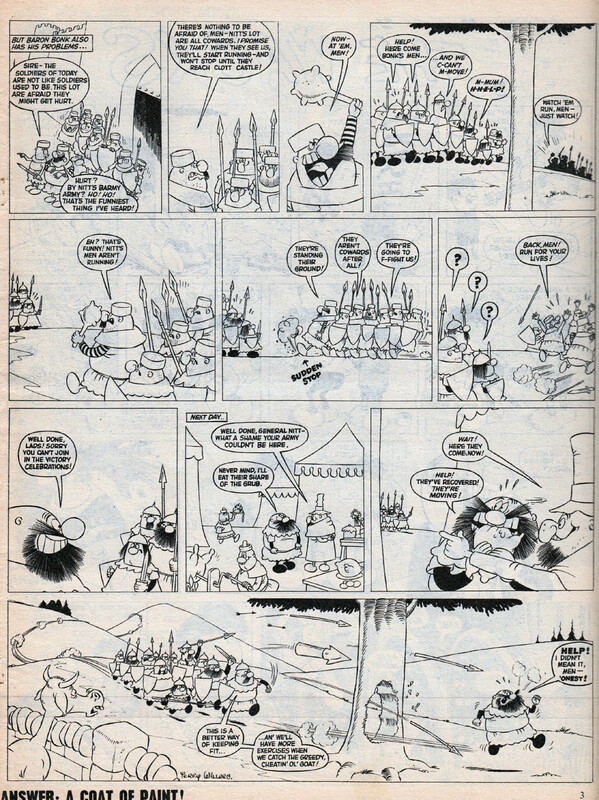 Resistance stories could easily be 63 pages of skulking about avoiding searching German soldiers and ghosts could easily look like normal characters drawn without enough ink. 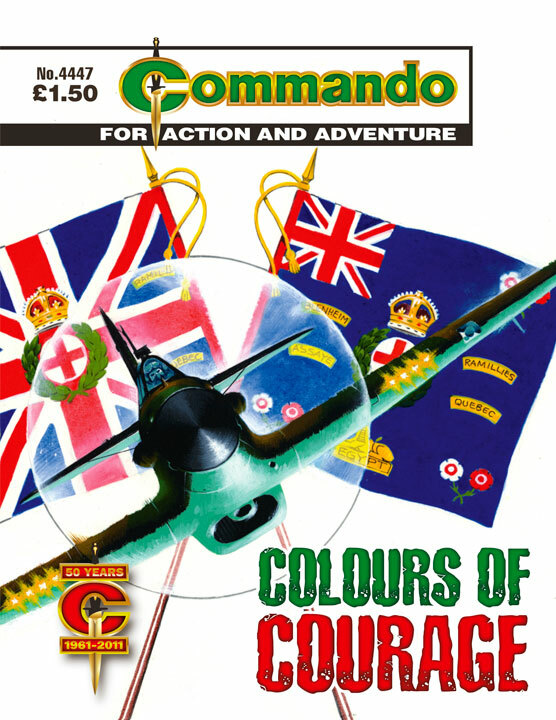 Thanks to ace story-teller Cyril Walker, Colours Of Courage cracks along with plenty of action to break up the tension. And Arthur Fleming — an art teacher from Glasgow — manages to skilfully depict a glowing figure despite only having black ink and white paper to work with. Wrapped in one of Ian Kennedy’s superbly drawn and laid-out covers it’s got all it needs for a cracking Commando. Corporal Bill Kirk felt the tiny life-raft rock lazily as the Jap struggled aboard. Both turned to look at the sinking Jap prison-ship they’d been on — Bill a prisoner, the Jap a guard. Then they turned back, to look at each other; and what that Jap read in Bill Kirk’s eyes made him start back in fear. But there was no escape for him. With only the vast empty ocean and the sharks circling the raft for witnesses, they grappled in a fight to the finish. 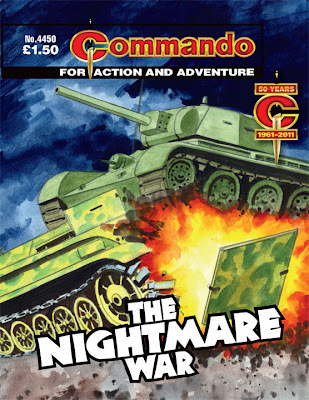 I’ve mentioned before that I my childhood Commando issues at the back of the garage a few years ago. Some I had to look at again to refresh my memory, but not this one. I don’t know how many times I read and re-read this in the 60s but it must have been a lot because I had almost total recall. 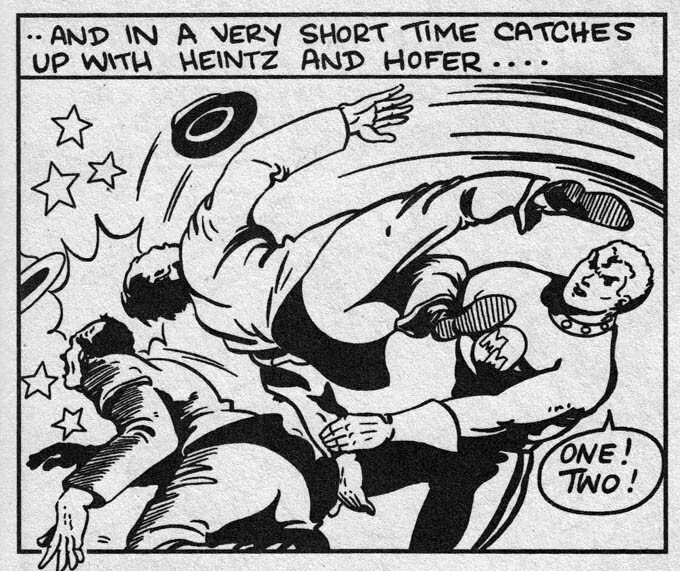 Ken Barr’s cover with its ethereal hand hovering over the action, Victor de la Fuente’s action-packed, high-energy inside art and Eric Hebden’s crackerjack of a story with its startling twist were just what the doctor ordered in 1965…and are equally so today. I think so anyway and I hope you’ll agree. As an aside, Ken Barr used a sheet of transparent plastic sheet with the outline of the hand painted on it to get that ghostly effect. I certainly didn’t know that in 1965. Simon Katz was a young German and a fervent anti-Nazi. A brilliant mathematician, he escaped Germany by the skin of his teeth and went to work as a code-breaker for the British. Not long after, Sergeant Barney Taft also made an escape – from the bullet-strafed beaches of Dunkirk. Though they were on the same side, when circumstances threw the pair together, they clashed bitterly. But could they manage to work together against a ruthless enemy? They would have to if they were to survive. Private Franz Bauer, a German Army engineer wounded during the invasion of France, was haunted by the deaths of his comrades in the same battle — wiped out by a mine. When he recovered he threw himself into his new job developing the remote-controlled Borgward IV demolition vehicle, hoping it might save other German lives. His chance to save thousands of lives would come, but he would be working alongside an unlikely ally — someone who had nightmares every bit as bad as Franz’s. 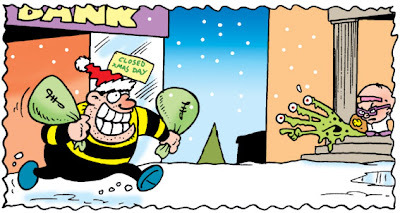 And just what is Postman Prat up to? Update: It didn't take long for some to start complaining on various forums about the price increase. 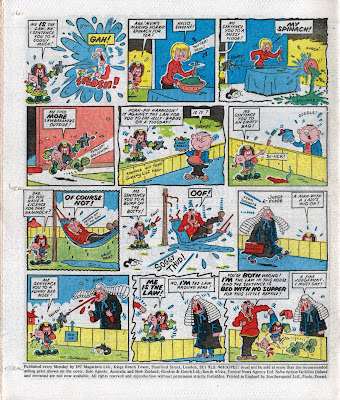 Dandy-bashing (and Beano-bashing) seems to be a popular sport amongst some comic fans. Well, I say comic fans. 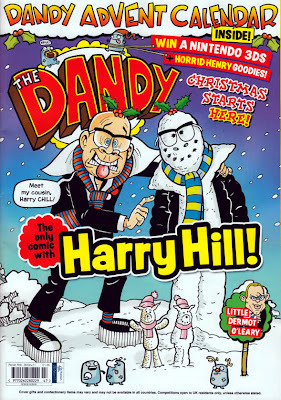 I get the impression that Dandy and Beano are the only titles some of them follow, judging by how they seem oblivious to the fact that budget cuts and price increases are affecting many titles. 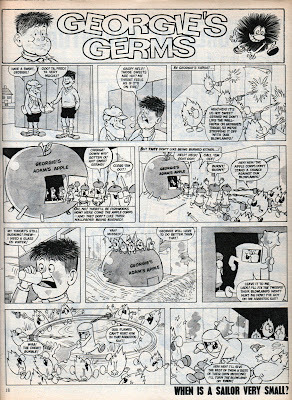 They also complain about the reduction in originated pages in Dandy and Beano. 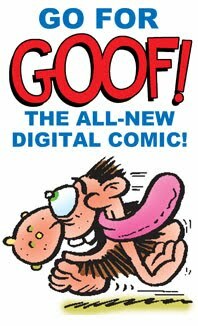 (Perhaps they haven't noticed that practically every Marvel and DC comic - dozens of titles - have also lost two pages of strip content recently, and that Marvel raised their prices from $2.99 to $3.99.) 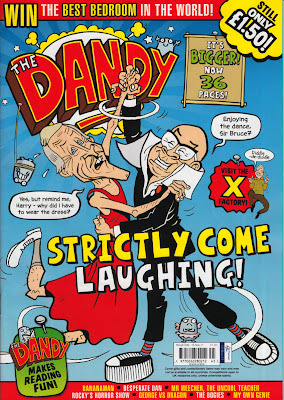 Folks, look beyond Dandy and Beano. Look beyond comics. There's a recession on and it's not getting easier. 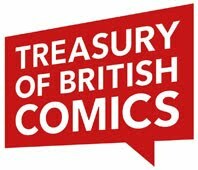 As I've said on various comic forums (and which has pretty much been ignored by the critics) each British comic is allocated its own budget. 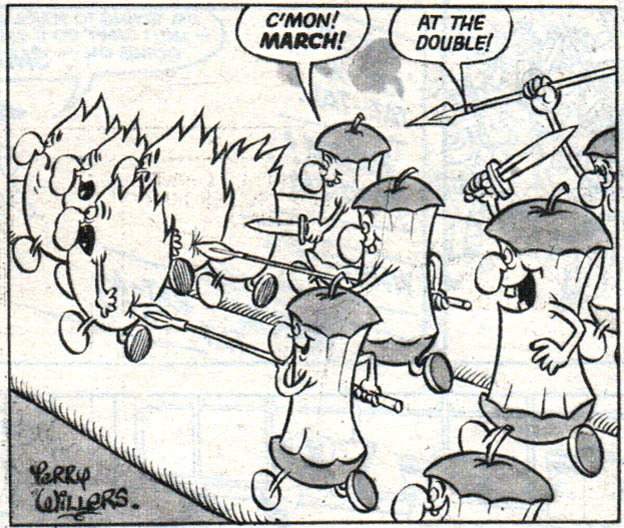 Sadly, these days, that budget can't always stretch to fill every page with new strips. So editors have to spread it out. 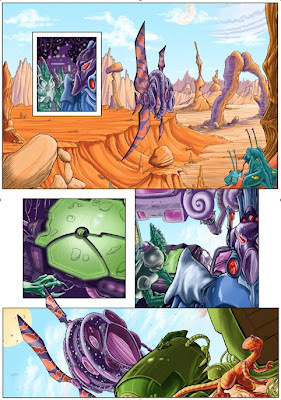 Some weeks the comics will feature more new stuff than others. A reduction in new material one week might simply mean more is being allocated for an upcoming issue (eg: the Christmas issue). I think fans should respect the editors for doing a juggling act, not crucifying them for not spending money they don't have. 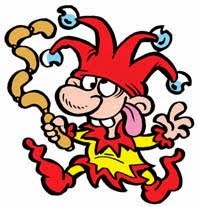 No one likes the situation, but the scrutiny and sneering of some "fans" towards children's comics does no one any good and just creates a growing, unpleasant pessimism on the forums. 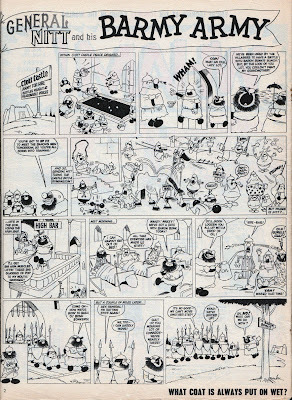 And let's not forget that reprints and "filler" (feature) material are not a recent development in British comics. Far from it! 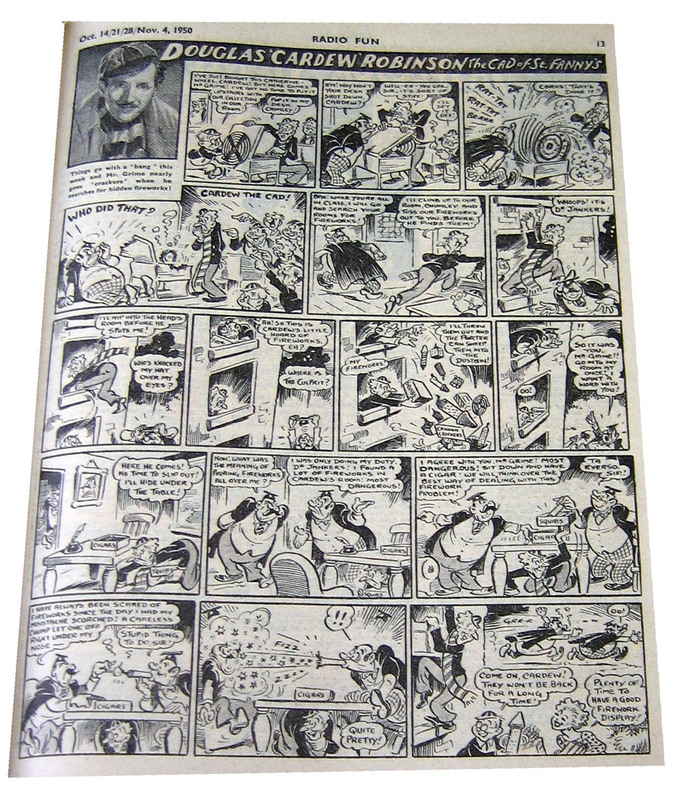 For just one example, 40 years ago The Dandy was running three pages of reprint every week, when it just had 20 pages. The IPC comics were often much worse, with reprints being a frequent way to pad out their weeklies. A better awareness of history might calm the outrage of critics somewhat. Does anyone have a time machine I could borrow? 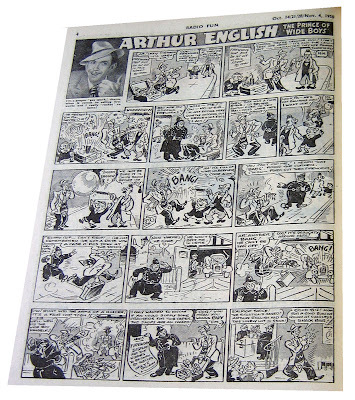 I want to go back to 1890 to moan to Alfred Harmsworth about the number of reprints in Comic Cuts No.1. It'll be the death of the comic industry that one. 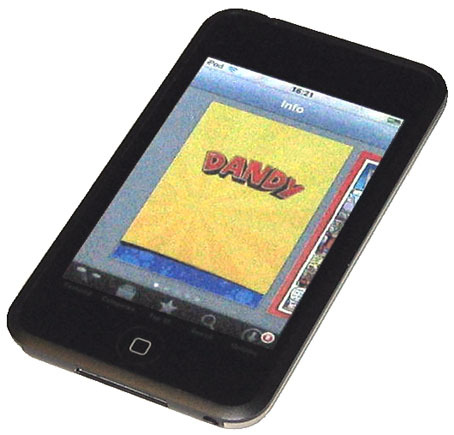 You can now buy The Dandy and The Beano to read on the iPhone or the iPad reports Scotland's Courier newspaper. 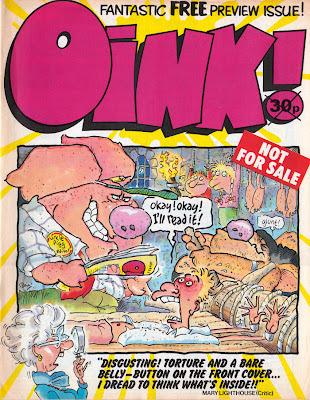 The comics are now available on the App Store as an alternative to buying the long-running paper editions. It's a far more convenient and, perhaps, more reliable way of obtaining the titles than hunting them down in newsagents. Mike Stirling, editor of The Beano said "it guarantees our fans can enjoy The Beano 24/7". 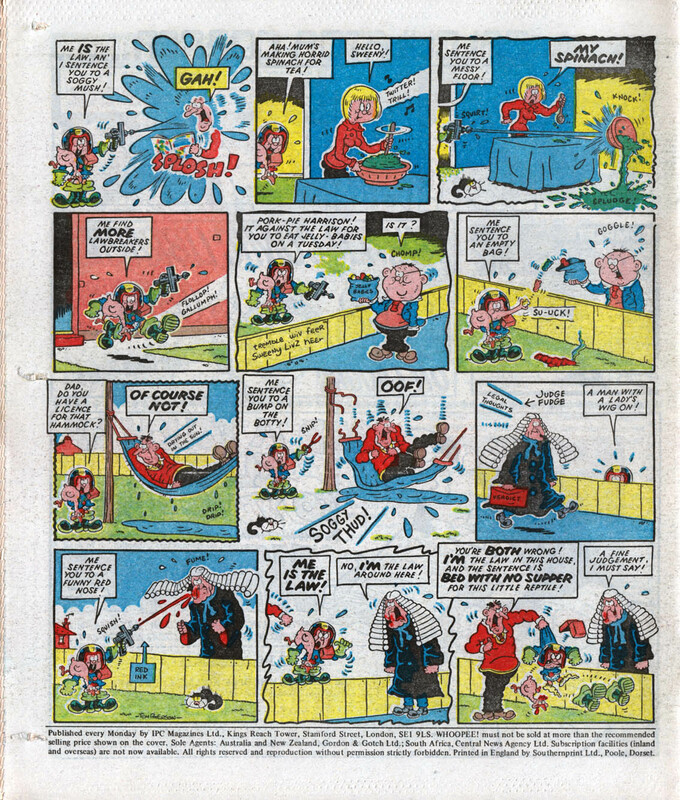 I think this is a welcome move by DC Thomson that should be applauded. 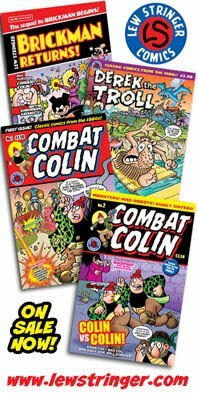 With an increasing problem of poor shelving displays in newsagents and the simple fact that many children just don't look for comics on the stands any more, digital editions are a good alternative to offer them. The App requires iOS 3.2 or later. 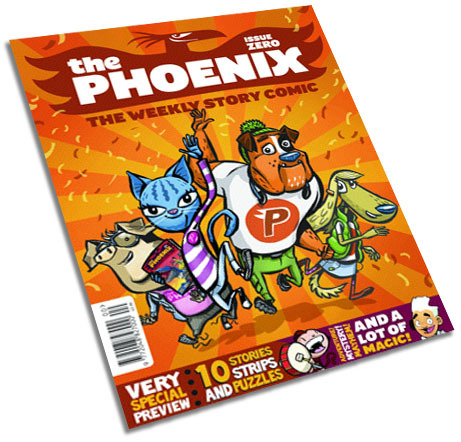 Readers anxious for the January arrival of Britain's new children's comic The Phoenix will be pleased to hear that a special preview issue will be available this weekend. The other bit of Phoenix news, and the most important, is that from today you can begin subscribing to the new comic ready for its launch in early January. 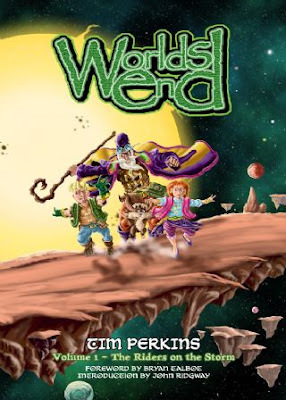 Over the past few years comic artist Tim Perkins has been hard at work on his creator-owned graphic novel Worlds End, and now the end product is about to be launched. Described as the first of a series of "science fusion" graphic novels, Worlds End Volume 1: The Riders on the Storm, is a fully painted book intended for all ages that is set on another world called Gaeryth, where a Mathemagician, called Gweldar, his familiar, Geek, a young boy, Ralf and a mysterious girl called Zephol are all that stand before an invading alien horde intent on aqua-forming the otherwise tranquil planet in the far reaches of space. 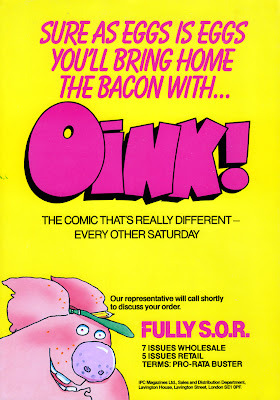 As Oink! 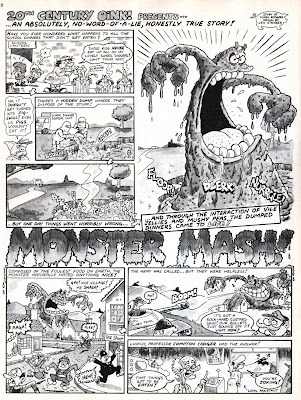 was printed on quality paper (as opposed to the newsprint of its companion comics Buster, Whizzer & Chips etc) I knew we could be a bit more adventurous with the rendering of the artwork so I thought a grey wash would give it more depth. I was really pleased with how the strip turned out and it remains one of my favourite pieces 25 years later. The artwork is a bit rough in places but I'm still happy with it. 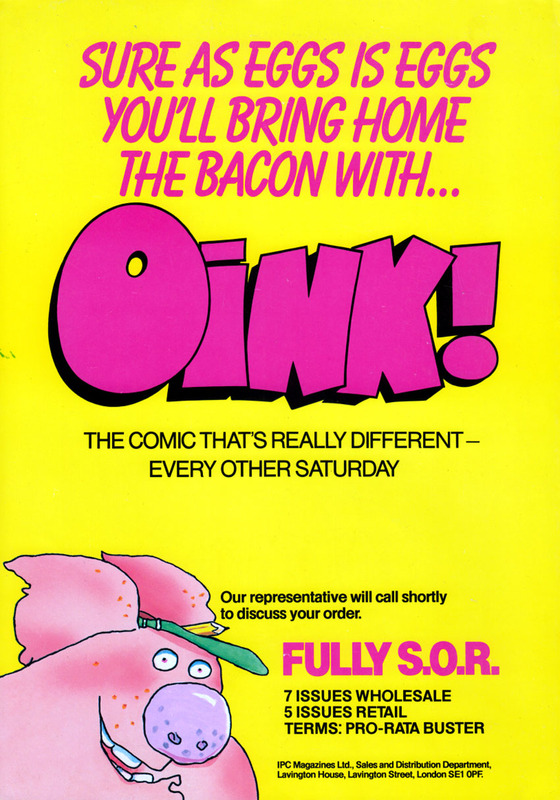 Pigswilla returned for two or three more complete stories during the run of Oink! and I'll show them here at some point in the future. 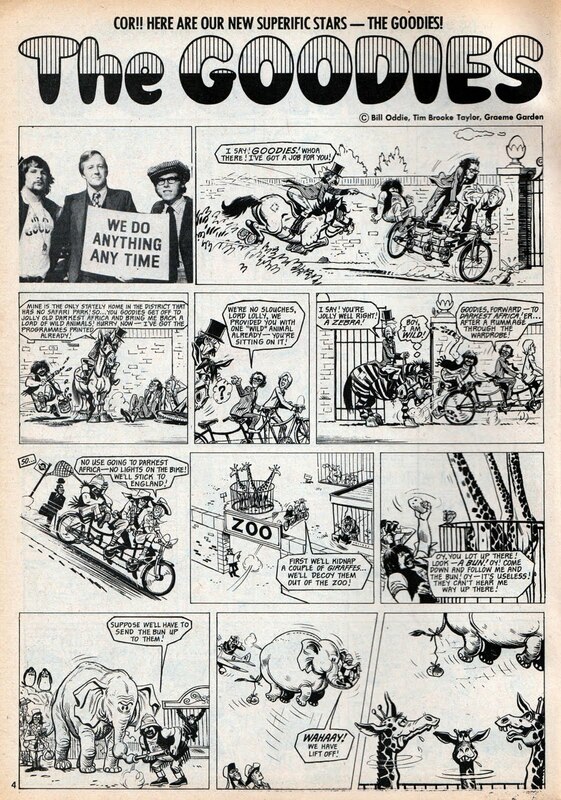 Sad news of another passing in the world of comics and cartoons, cartoonist Terry Willers died on November 9th, aged 76. Although born in the UK, Terry lived and worked in Ireland for over 40 years. 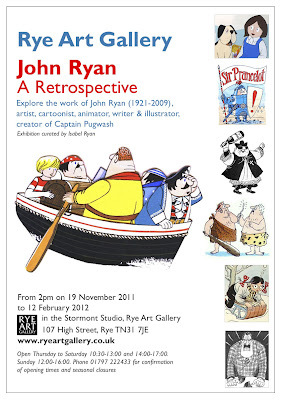 He began his drawing career aged just 15, working for a Disney studio in London. 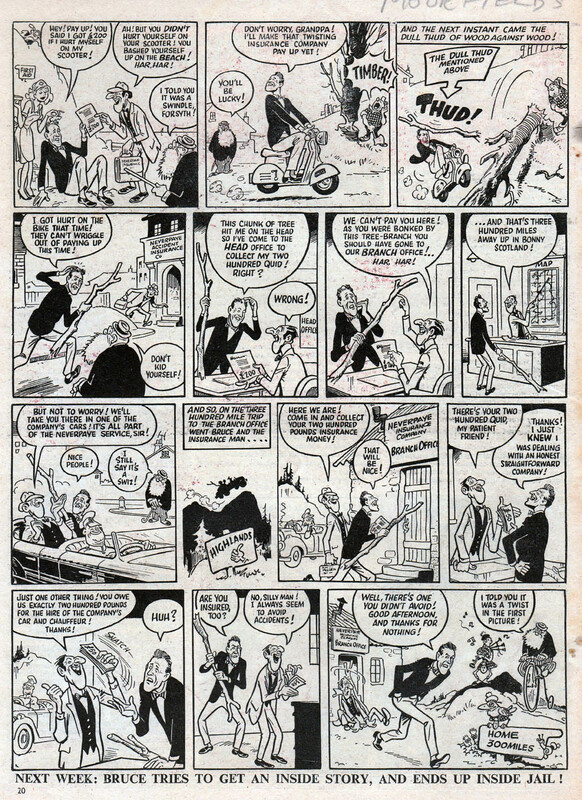 He went on to draw newspaper strips for various European newspapers including strips from the Dutch Toonder studios in the 1960s. 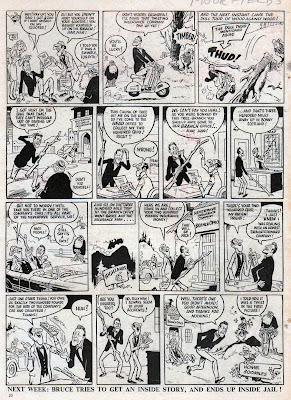 It was also during the Sixties that Terry became an artist on Odhams' Wham! 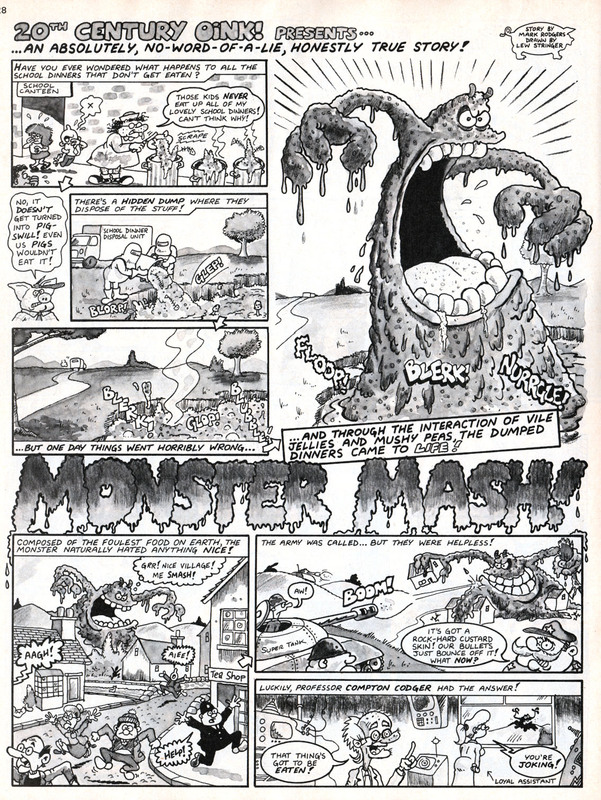 weekly as one of the people brought in to "ghost" the look of Leo Baxendale's work. 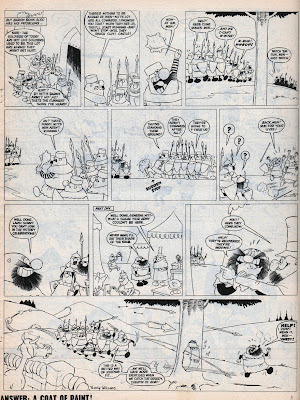 Willers' own style was still evident in those pages though and he was allowed to sign his work. 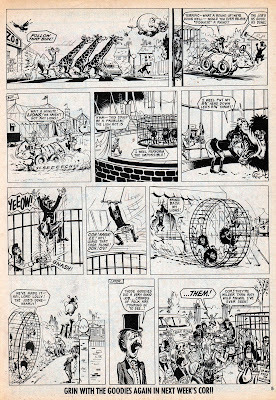 He also worked on strips for other comics, such as The Dandy and The Beano. 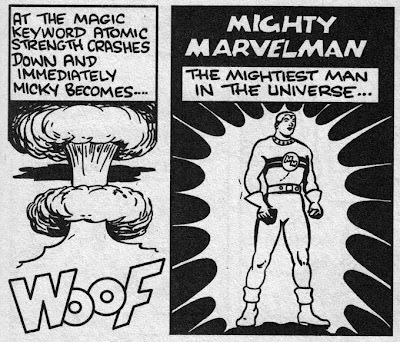 Mick Anglo, creator of Marvelman, passed away on October 31st at the age of 95. Although Marvelman was easily the character he was most associated with, Mick Anglo's career in publishing saw him enjoy a variety of accomplishments. He freelanced in commercial art when he left school, drew cartoons for overseas army newspapers during the war, and then became an author of western, romance and crime novels under the name Johnny Dekker as well as continuing to draw for various publishers. 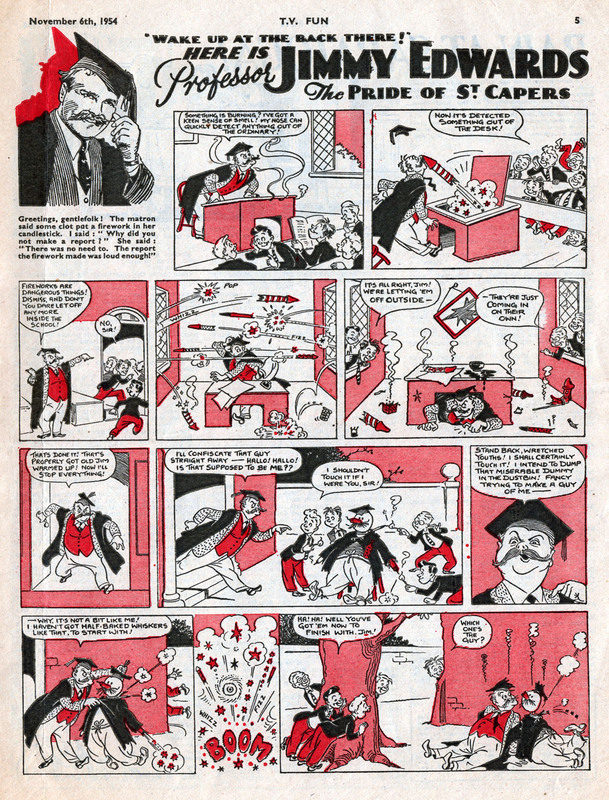 Between 1950 to 1952 Anglo produced various comic strips for the Arnold Book Company (run by Arnold Miller) and for Arnold's father's company L.Miller & Son. 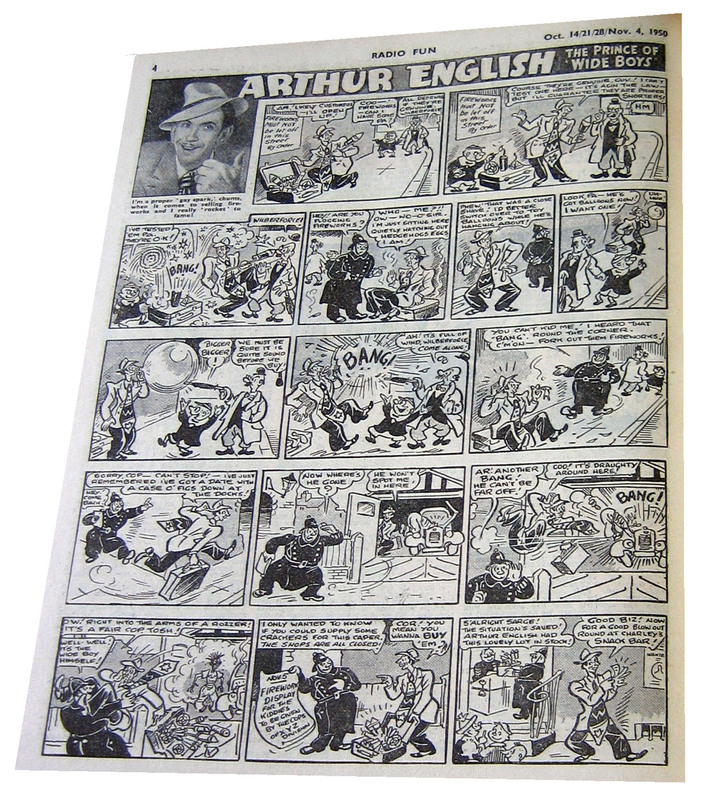 In 1954 Anglo opened his own company, Gower Studios, to package comics for various publishers (ie: produce full comics to the specifications of a publisher, ready for printing). Mick Anglo's staff included Ron Embleton, Bob Monkhouse, and Denis Gifford. He also gave Don Lawrence his first break, years before Lawrence would go on to produce the stunning Trigan Empire series. 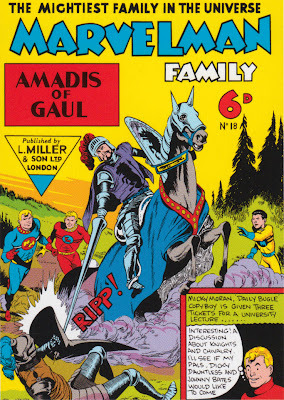 When legal problems between Fawcett Publications and National Comics (now DC Comics) forced Fawcett's Captain Marvel comics to close, Mick Anglo created Marvelman to fill the gap for the Captain Marvel UK reprints, with Anglo and his studio producing brand new stories. The similarities between Captain Marvel and Marvelman were plain to see, but readers eagerly took to the character (and its spin-offs Marvelman Family and Young Marvelman) and the comics continued into the early 1960s. 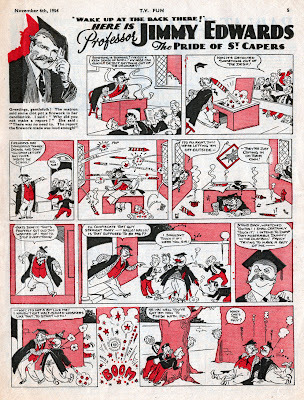 Bearing in mind those comics were weekly, Anglo's output was considerable. 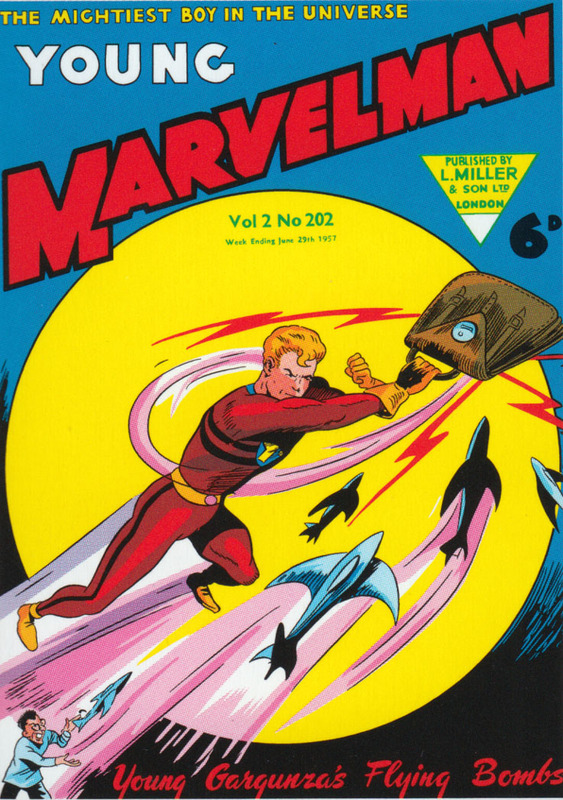 Even today, Marvelman remains the most successful British superhero in terms of how many issues were produced (346 issues, plus the same number of Young Marvelman comics, and 30 issues of Marvelman Family). 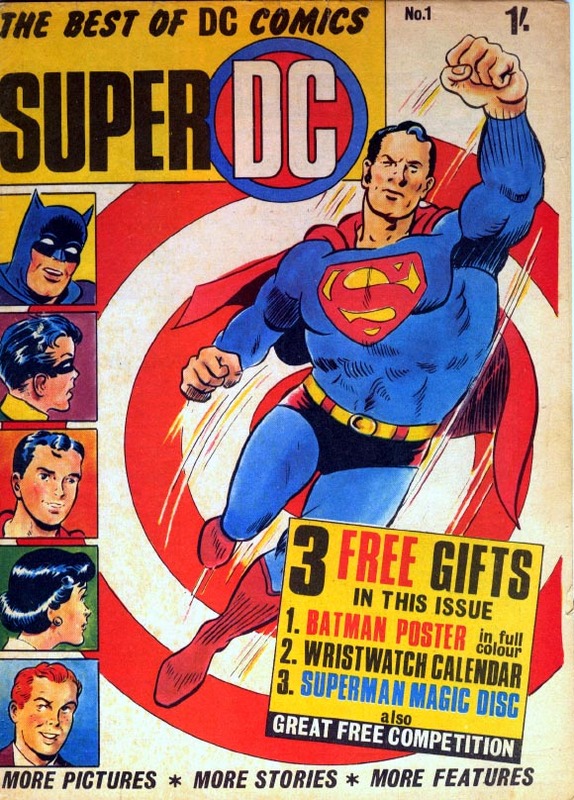 Mick Anglo continued to produce more comics in the 1960s, including, amongst other things, becoming editor of City Magazines' TV Tornado in 1967, and Super DC for Top Sellers in 1970. He retired in the 1980s. In 1982 Dez Skinn revived Marvelman (with Alan Moore as writer and Garry Leach as artist) for the new monthly anthology comic Warrior. 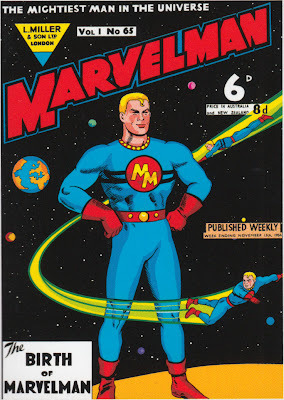 Here things became darker, not only in the tone of story but also in reality, with Marvel Comics threatening legal action over the name of the character, with Marvelman becoming Miracleman for the American editions published by Eclipse Comics. 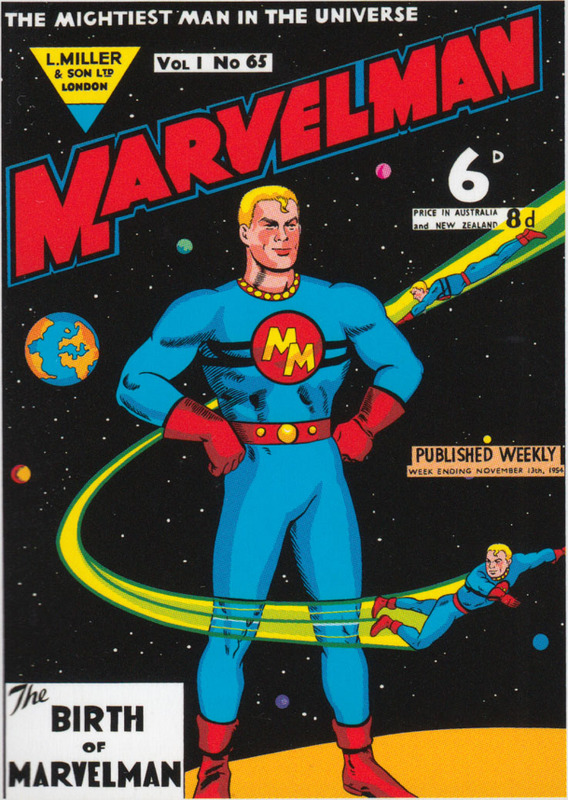 The story of further developments is a saga in itself, but in 2009 Mick Anglo sold the rights of Marvelman to Marvel Comics. Since then, Marvel have produced a mini-series of reprints (Marvelman Family's Finest) and a few hardback reprints. No new Marvelman series has yet been announced. I've just been contacted by Isabel Ryan, the younger daughter of Captain Pugwash creator John Ryan, and she tells me there's a retrospective exhibition of her late father's artwork opening on November 19th at the Rye Art Gallery, East Sussex. Isabel says she enjoyed selecting the work for the show and that the exhibition will feature "book illustrations, strip cartoons, and TV animations (over 50 works)". A few weeks ago The Beano added 4 extra pages and now it's the time of The Dandy to increase its page count to 36 pages every week. 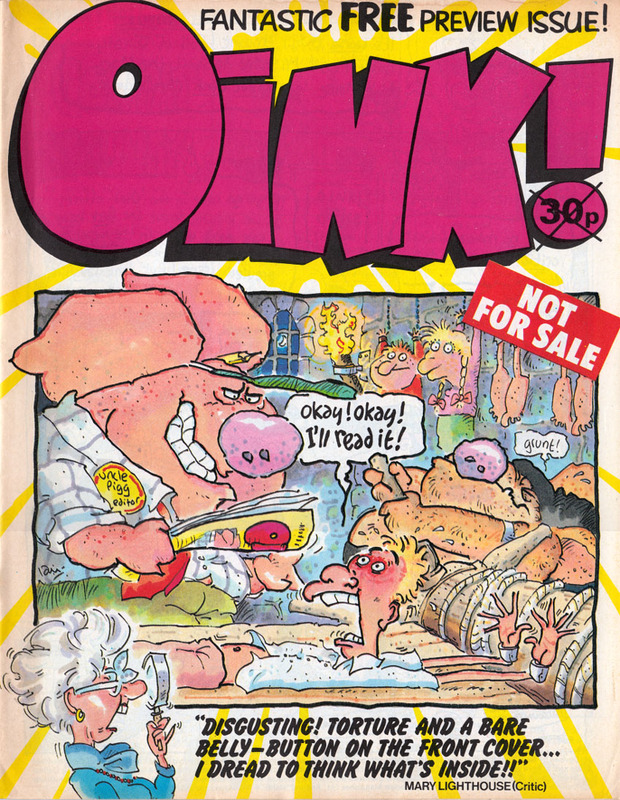 The price remains the same, at just £1.50 an issue, but the paper stock changes to a thinner, glossy format, similar to that used by American comics. Reproduction of the artwork is perfect, and I'm sure everyone will be pleased with that, although I do miss the sturdy paper stock that was used over the past 12 months. 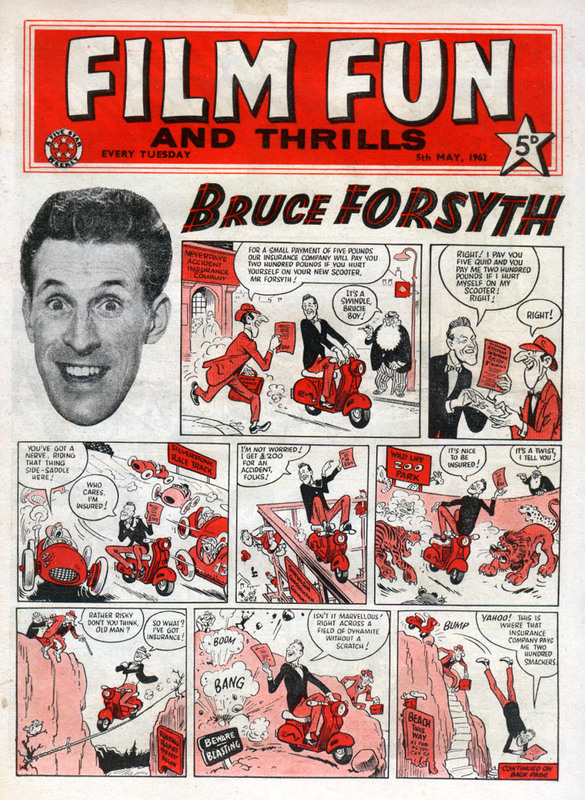 As you can see from Nigel Parkinson's great cover, Bruce Forsyth is back in his own comic strip inside (well, for one week only). It's just like the days of Film Fun when Brucie was the cover star back in 1962! Artwork below by Roy Wilson. 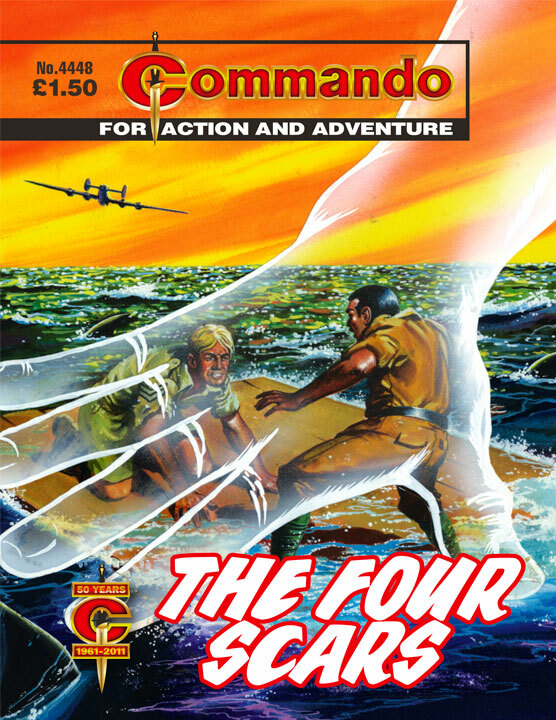 Published this Thursday here's the latest four editions of Commando. 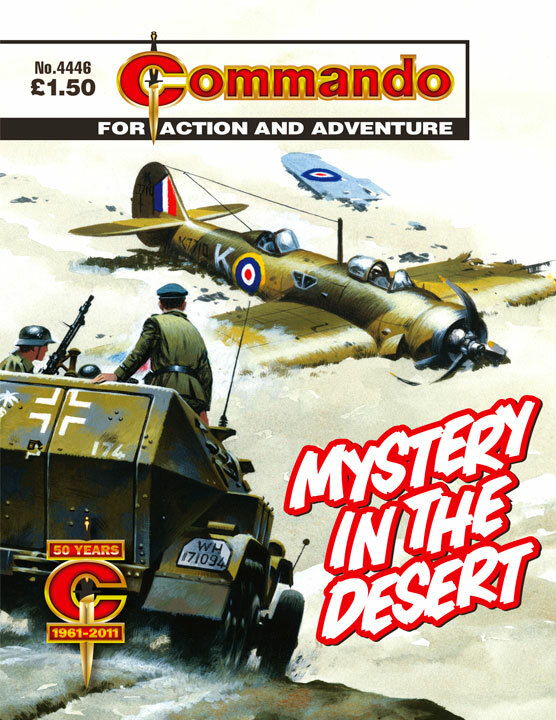 Continuing to celebrate its 50th anniversary one of the issues reprints No.2 from 1961, with a reprint of issue 1 coming next month. 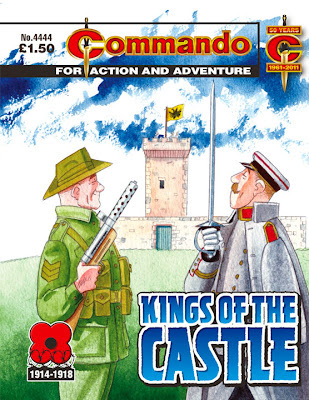 There's also two stories set in World War 1 as an appropriate tie in to Armistice Day. As a soldier in the no-man’s-land between your own trenches and the enemy’s in World War One, you expected to get shot at. British soldier Alan Roux and his mates certainly did. What they didn’t expect was to have to dodge bullets fired from their own side. Many strange battles were fought during the 1914-18 war but surely the strangest involved a pair of French regimental policemen, a squad of Australian infantrymen, a bunch of escaped German POWs…and a mediaeval stone tower. Commando No 4445: THEY CALLED HIM COWARD! The powerful Japanese Army was island-hopping its ruthless way down through the South Seas towards Australia. Many a brave Aussie soldier, standing his ground in the green hell of the island jungles, was bulldozed into eternity by the sheer weight of the Nipponese army. And one Englishman in the Australian army was caught up in the desperate battle. Bob Palmer he was christened, but COWARD was the name they branded him with. Coward, the word that turns a man into the loneliest being on earth, for what soldier seeks a coward for company? But there was no craven blood in Bob Palmer’s veins — and he proved he was ready to spill every drop as he blasted Jap after Jap into kingdom come. A classic Commando tale this, a man the victim of a misunderstanding who has to prove his accuser wrong. And with plenty of action along the way to add some spice. That the two men are on the same side but different nationalities hardly matters nor that there’s a third character trying to be a peacemaker between them. 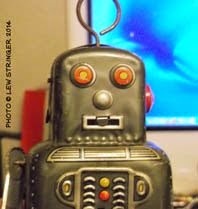 What does matter is the use of the emotive word Coward in the title and through out the story. It’s one of those loaded words that can’t be spoken except without venom — as amply demonstrated here by Sergeant Fettis. 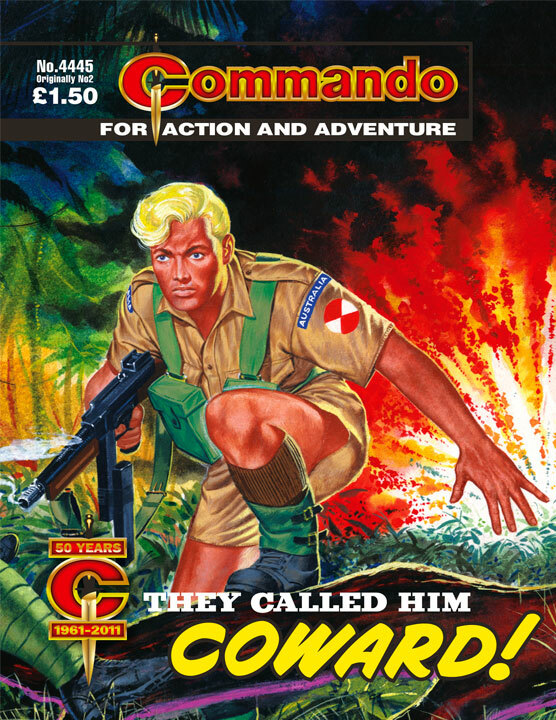 Note to the 1961 Commando editor…the word Coward in the title is far too small, make it bigger. It was going to be Captain David Poole’s toughest mission yet. Posing as a German spy he was to feed the Nazis with false information which would lead their forces into a trap. Everything was going like clockwork until David met up with a certain Australian pilot — and then everything started to go terribly wrong. As I recall, Ken Gentry who penned this tale was a South African newspaperman with a sideline in Commando stories. 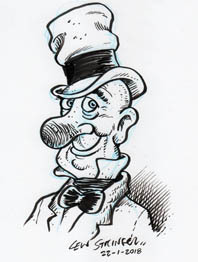 I worked on a few of his over the years. Here he weaves a web of deceit with a double-crossing British agent, a straightforward Aussie pilot and a luckless German commander. 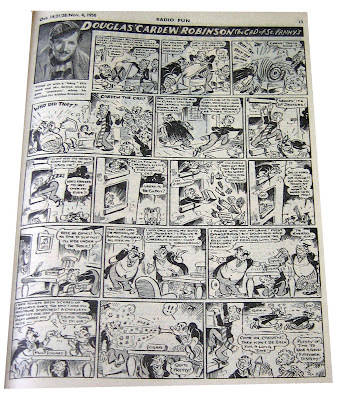 Cecil Rigby who provided the inside art for the story had also worked on newspapers, as a very good caricaturist and he wasn’t bad at Commando either, having been in at the start. Ian Kennedy, who provided the cover, puts himself in the cockpit of every plane he draws. I hope he made an exception with this one — that looks like a painful crash. 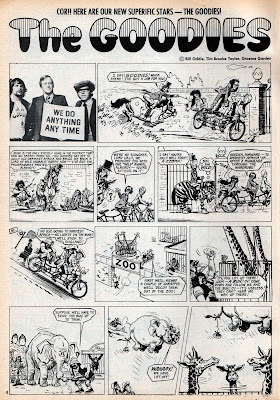 As most of you know it's been a long standing tradition for British comics to sometimes feature strips based on celebrities of the day. 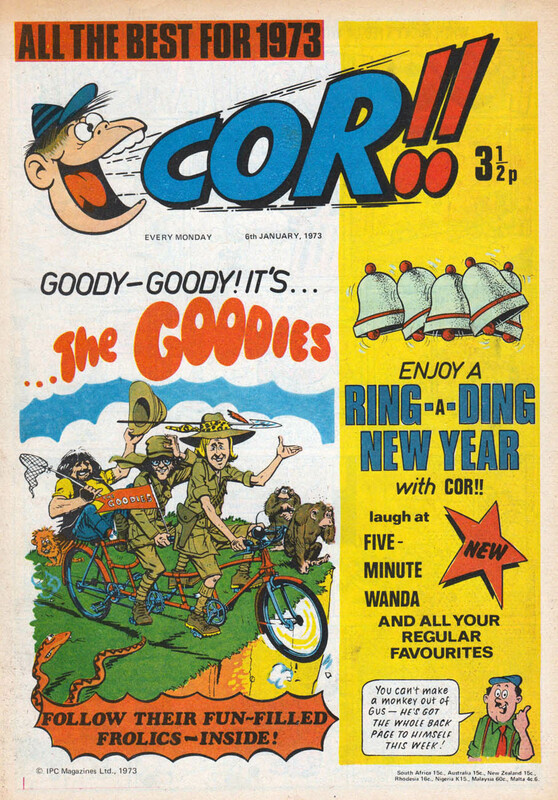 One such example was in 1973 when Cor!! started running a humour strip based on TV stars The Goodies. 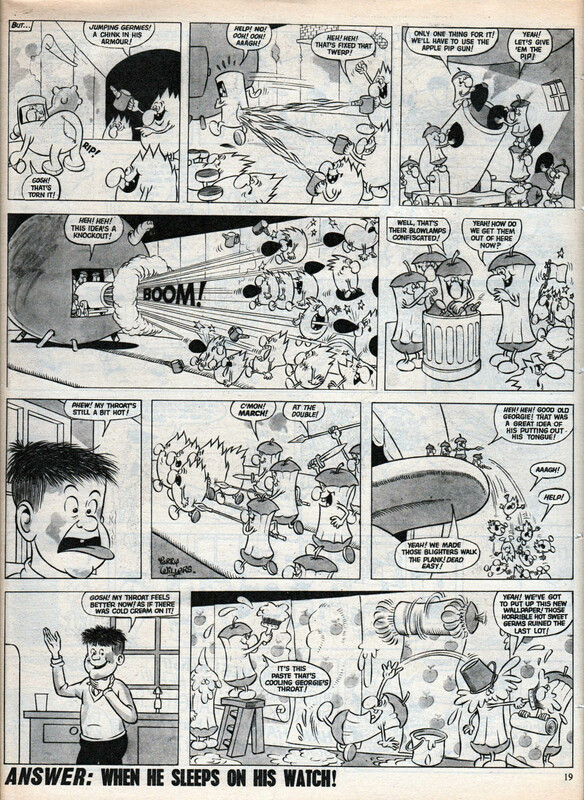 The artwork was by Joe Colquhoun, most famous for being the first artist of Roy of the Rovers in the 1950s and for his remarkable work on Charley's War in the 1980s. Here he displays his ability to turn his style to humour. 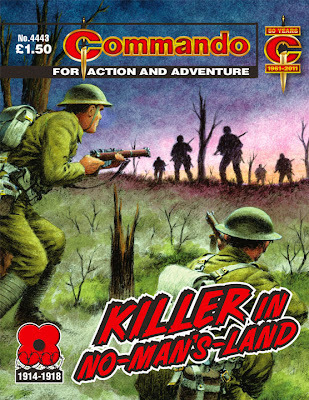 It's a million miles away from the grim trench warfare of Charley's War but Joe's excellent brushwork still shines. 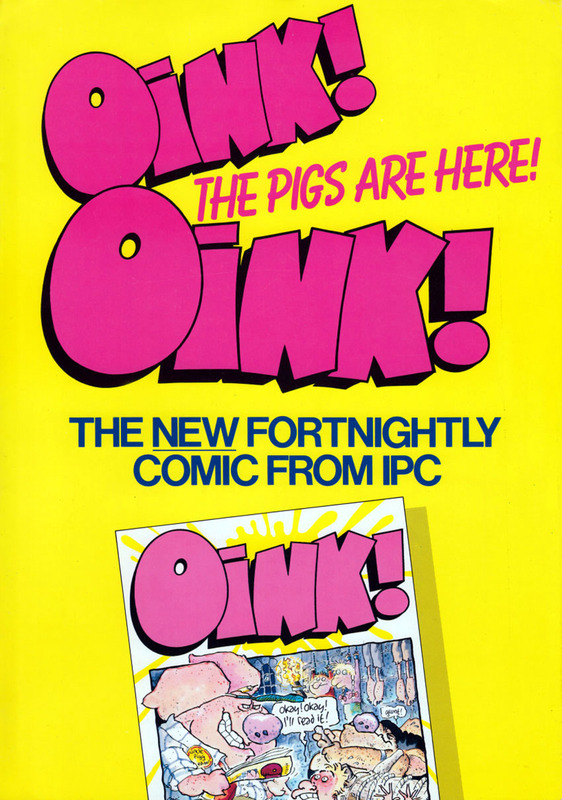 Back in 1985 IPC indulged in a rare moment of self-parody in the comics departments when the cover of their humour weekly Whoopee! 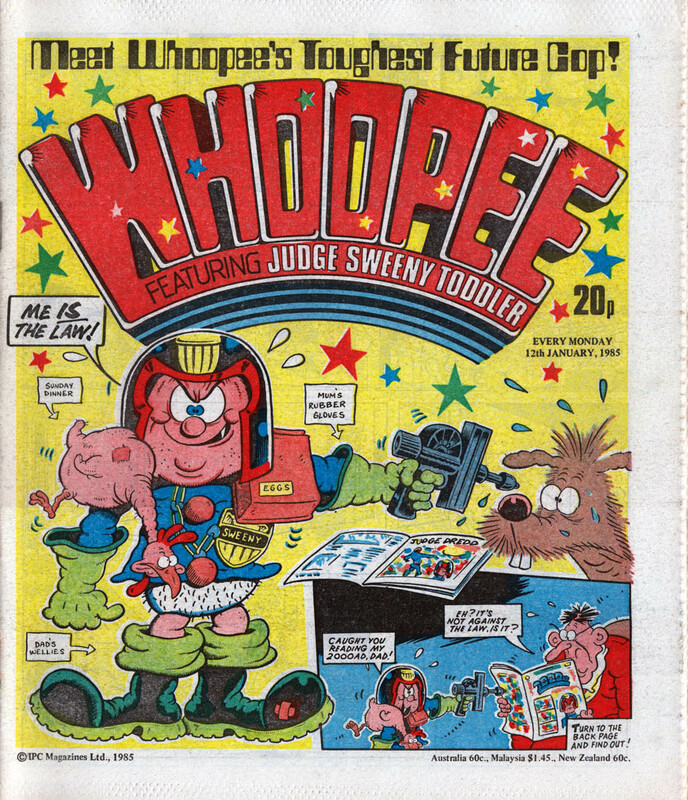 spoofed 2000AD. 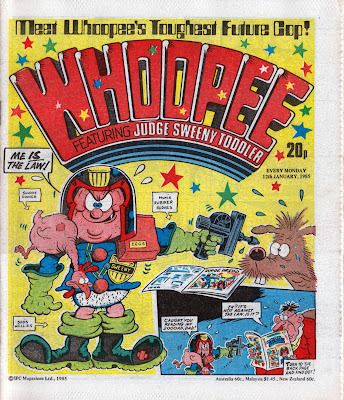 For one week only the popular bad baby strip Sweeny Toddler became Judge Sweeny Toddler in a homage to Judge Dredd. 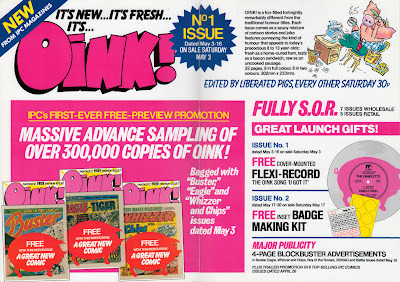 Even the logo for that issue was redesigned to mimic the then-current 2000AD masthead. Script by Graham Exton, artwork by Tom Paterson. Anyone found not laughing will be sentenced to 30 days in an iso-cube. It's Bonfire Night and the stars are bright. 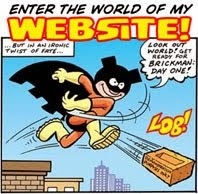 Well, it's forecast clouds and rain actually but you can still enjoy the fireworks in this trip back in time to look at the pages of a couple of 1950s comics. 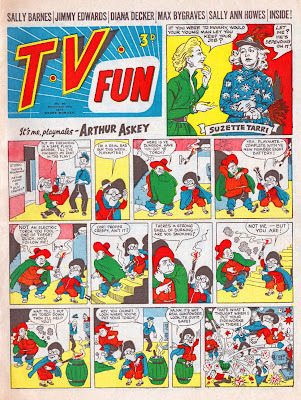 First up, here's the 1954 firework edition of TV Fun No.60. 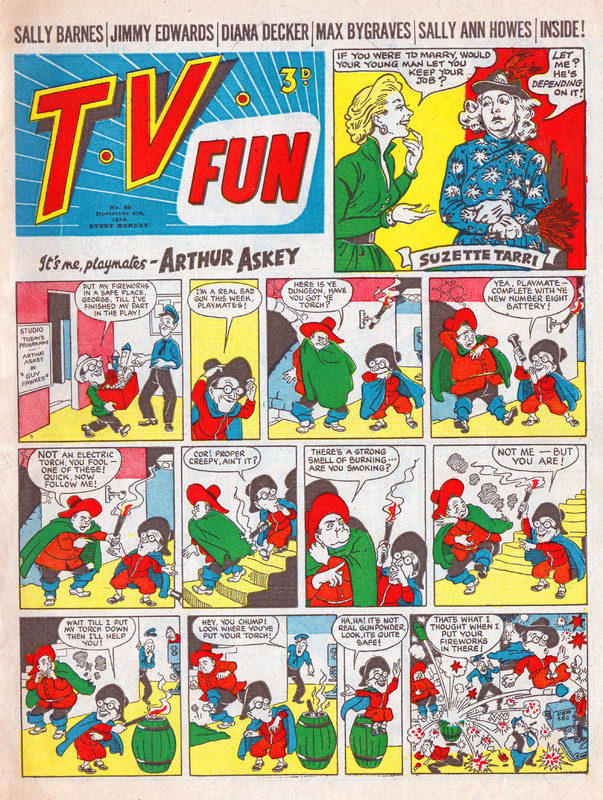 The cover strip featuring diminutive funnyman Arthur Askey was drawn by Arthur Martin, who would in 1971 be the original artist of Chalky for Cor!! comic. 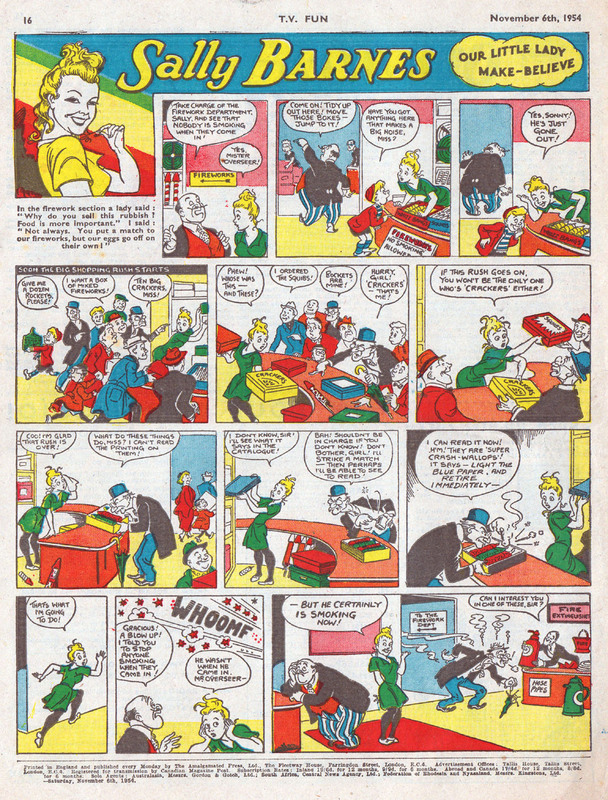 The prolific Reg Parlett was also the artist of the back cover strip, Sally Barnes. 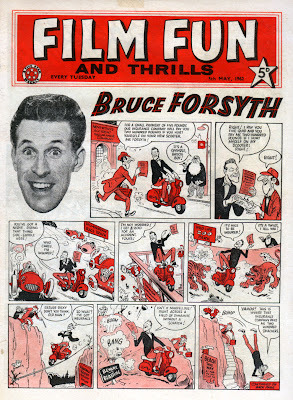 Reg of course illustrated thousands of pages spanning over a career of more than 60 years. 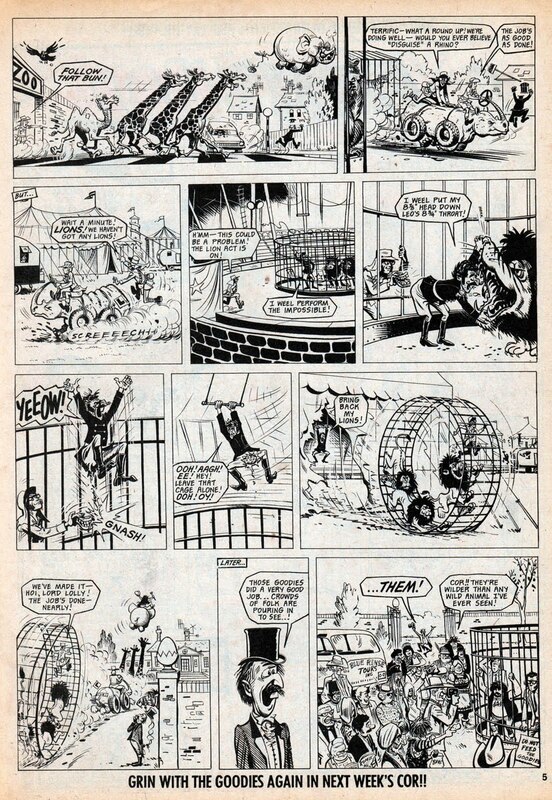 The body language of the characters in this strip is superb, proving Reg to be a true master of comic art. 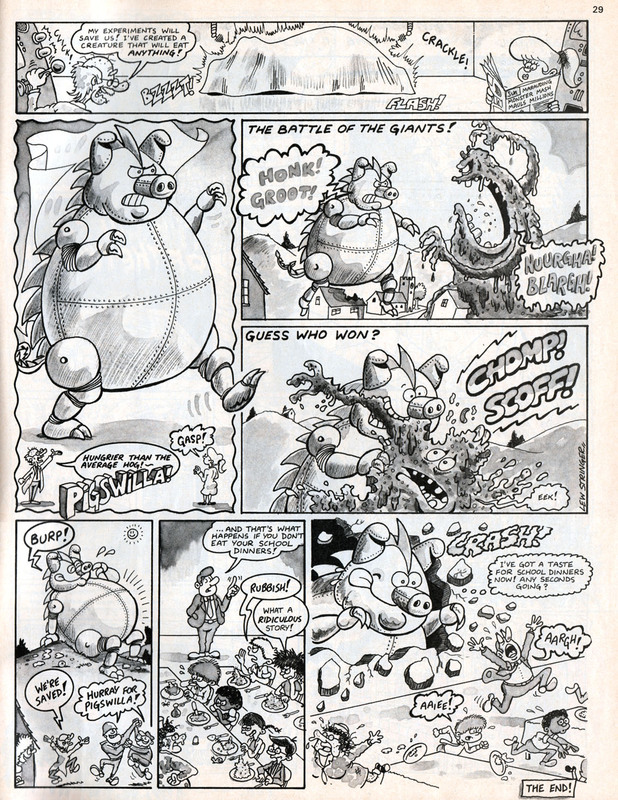 Like his brother George, Reg was particularly good at drawing the curves of the female figure, something that Amalgamated Press played up in the 1950s but which Fleetway toned down in the 1960s. A few years earlier Radio Fun had featured a couple of firework-themed strips in its 1950 issue. 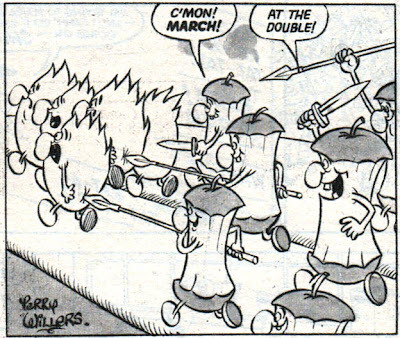 The AP comics were going through a bad patch at the time. 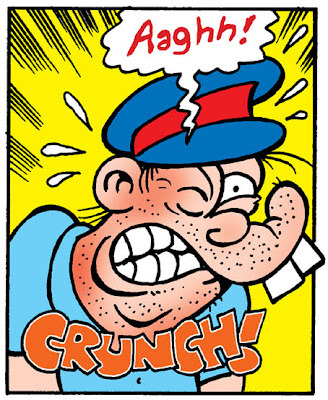 Due to what the editor termed "production difficulties" (industrial action by the printers) some comics skipped several weeks. When Radio Fun did reappear its cover showed a combined numbering (No.627/8/9/30) and combined dates on the page headers (Oct. 14/21/28/Nov. 4, 1950) even though it only had the usual 16 pages. 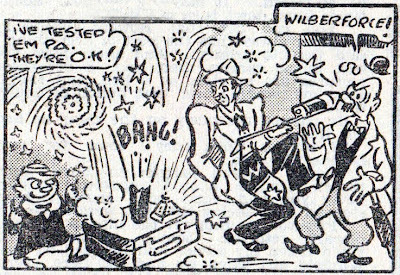 From the same 1950 issue here's Douglas Cardew Robinson (drawn by Reg Parlett) indulging in more firework tomfoolery. 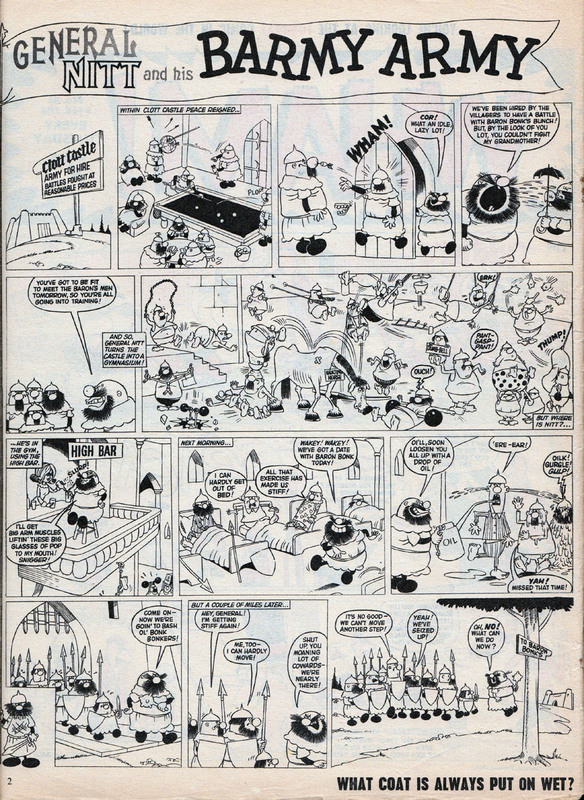 You'll notice that all of these strips involve characters coming into direct contact with exploding fireworks. 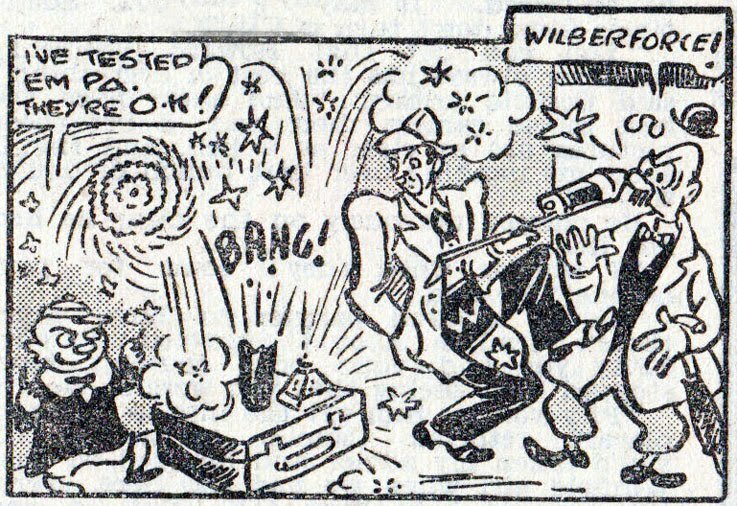 Something that UK comics eventually stamped out in later years for fear of presenting dangerous explosives as toys. Wherever you are, have a happy and safe November 5th!